I’ve had a relaxing couple of days hanging out with my mom after my defense. Emily had to take off the same night for her friend Beth’s wedding in New Hampshire so I had the weekend to spend with my mom. We basically just hung out and walked around Corvallis a bit during the Saturday market. I don’t think she has the energy anymore to do a great deal of traveling around the state like last time so we just took it easy. Tonight Jason was having a bbq and invited me over. My mom decided to take it easy in her hotel after walking around during the day in the sun. I was watching a bit of TV when I heard squeeling tires and a crash. When I went out side I looked up to see transformers in the street across from us blowing up! Kevin and Alexa followed me as I grabbed my longboard and went to see if everyone was ok. 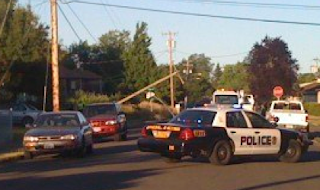 When I turned the corner power lines were down in the street and an SUV was pinned underneath a telephone pole it had driven through, after t-boning another sedan! I skated up to the guy still in the SUV (the woman in the car had gotten out and ran) and shouted to him not to touch anything metal. I didn’t see any lines on his vehicle but wanted to make sure. 911 had been called and soon I heard sirens coming. I skated back down the street to get out of the way and as I got closer to Kevin and Alexa I noticed I had skated very close to the down power line myself! Whoops! There were a ton of people milling about to check out the accident and I didn’t want to be a gawker myself so I went over to Jason’s for some food as I was sure electricity wouldn’t be back on the rest of the night. To my surprise they had it back on to our street in an hour (must have re-routed it) and I was able to relax watching some movies for the rest of the night. I can’t believe how fast that guy must have been going down a 25mph street to first t-bone a car then still have enough momentum to drive completely through the base of a thick telephone pole... sure he got a ticket for that one!